Reading and share top 3 famous quotes and sayings about Tansy by famous authors and people. Browse top 3 famous quotes and sayings about Tansy by most favorite authors. 1. "I'm a shreddermouf, aren't I?' 'I was afraid of that,' said Tansy. He was going to keep her in his larder until he was hungy again, and then he was going to rip her apart. 'Dis is my lair', said the shreddermouth proudly. 'It's de best lair in Tiratattle.' 'Is it?' said Tansy. 'Oh yes. It's a drainage tunnel. Goes right up to de surface, it does. Lots of storage space. My name's Gulp.' 'Tansy,' said Tansy, deciding not to ask him what he kept in his storage space and wondering whether introductions were quite the thing." 2. 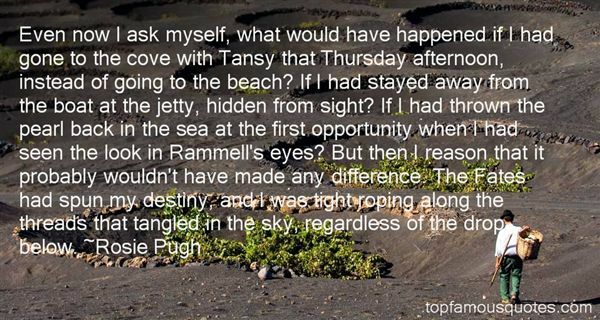 "Even now I ask myself, what would have happened if I had gone to the cove with Tansy that Thursday afternoon, instead of going to the beach? If I had stayed away from the boat at the jetty, hidden from sight? If I had thrown the pearl back in the sea at the first opportunity when I had seen the look in Rammell's eyes? But then I reason that it probably wouldn't have made any difference. The Fates had spun my destiny, and I was tight roping along the threads that tangled in the sky, regardless of the drop below." 3. 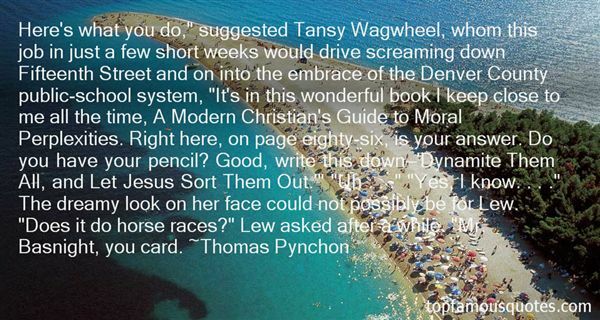 "Here's what you do," suggested Tansy Wagwheel, whom this job in just a few short weeks would drive screaming down Fifteenth Street and on into the embrace of the Denver County public-school system, "It's in this wonderful book I keep close to me all the time, A Modern Christian's Guide to Moral Perplexities. Right here, on page eighty-six, is your answer. Do you have your pencil? Good, write this down—‘Dynamite Them All, and Let Jesus Sort Them Out.'" "Uh . . ." "Yes, I know. . . ." The dreamy look on her face could not possibly be for Lew. "Does it do horse races?" Lew asked after a while. "Mr. Basnight, you card." Live and be happy, beloved children of my heart, and never forget that, until the day comes when God will deign to reveal the future of man, all human wisdom is contained in these words: Wait and hope!" (509)."